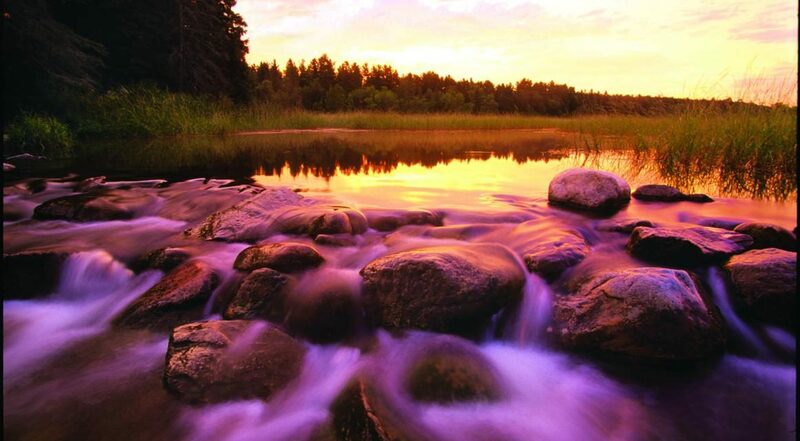 Itasca State Park claims the headwaters of the Mississippi River. 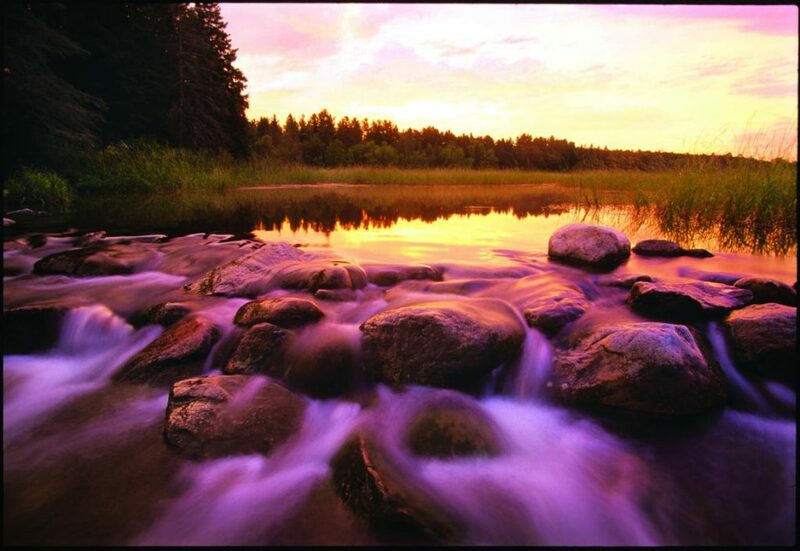 In a serene setting surrounded by majestic pines, the mighty Mississippi begins as a humble stream flowing out of Lake Itasca on its 2,552-mile journey to the Gulf of Mexico. A log monument signifying the river’s source is one of Minnesota’s irresistible photo ops. A pilgrimage site for tourists from around the world, the Mississippi headwaters help make Itasca State Park one of the busiest in the system. Attracting nearly a half million visitors a year, the 32,000-acre preserve in northwest Minnesota lies 20 miles north of Park Rapids and 30 miles south of Bemidji. Founded in 1891 to protect the area’s giant pines from logging, Lake Itasca is also Minnesota’s oldest state park and among its largest. It encompasses more than 150 lakes, Lake Itasca being the most prominent. Exhibits in the visitor center and displays in its outdoor plaza spotlight the Mississippi River’s history, cultural importance and the story of how Henry Rowe Schoolcraft, led by Ojibwe guide Ozaawindib, found the headwaters in 1832 after explorers had been searching for the source for over 300 years. 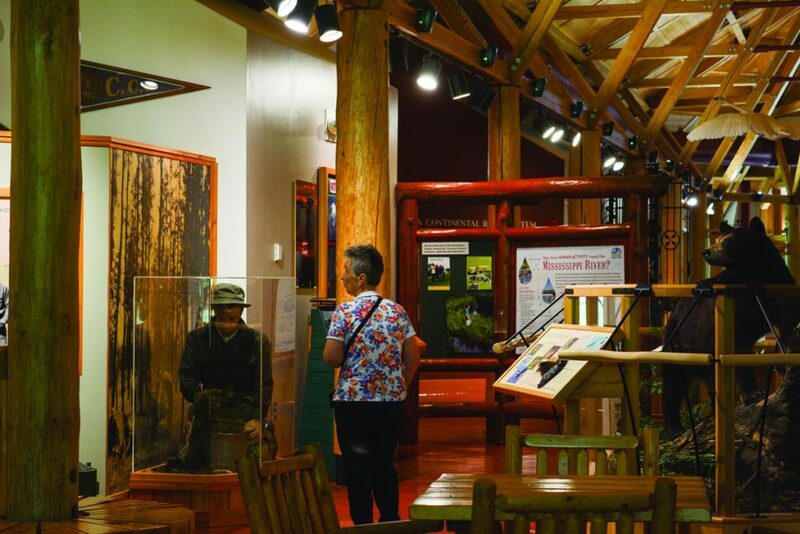 The spacious Jacob V. Brower Visitor Center, near the park’s south entrance, has an excellent museum with exhibits on the region’s heritage, including Ojibwe activities ranging from maple syrup and wild rice production to tanning hides, wigwam building and commercial fishing. Visitors also learn about forest fi res, the Mississippi River, local flora and fauna, and the park’s history as a camping destination and site for Civilian Conservation Corps (CCC) projects in the 1930s. Groups get a good overview of Itasca State Park on the 10-mile Wilderness Drive, a scenic loop that showcases the tall trees that form a canopy over the road. 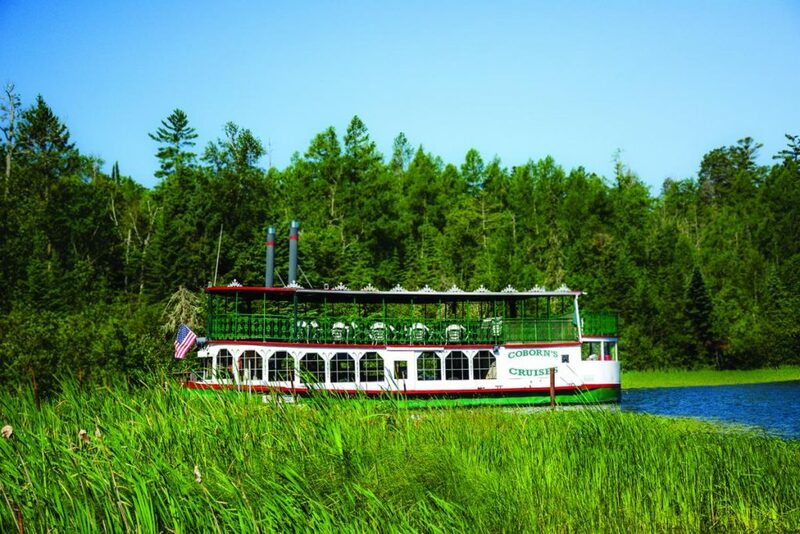 From Memorial Day weekend to September, a two-hour cruise on the Chester Charles II excursion boat, narrated by a park naturalist, follows Schoolcraft’s route to the headwaters and provides a look at birds such as eagles, loons, grebes, cormorants and herons. Douglas Lodge, dating to 1905, is a two-story log building reminiscent of national park lodges built in the early 20th century. 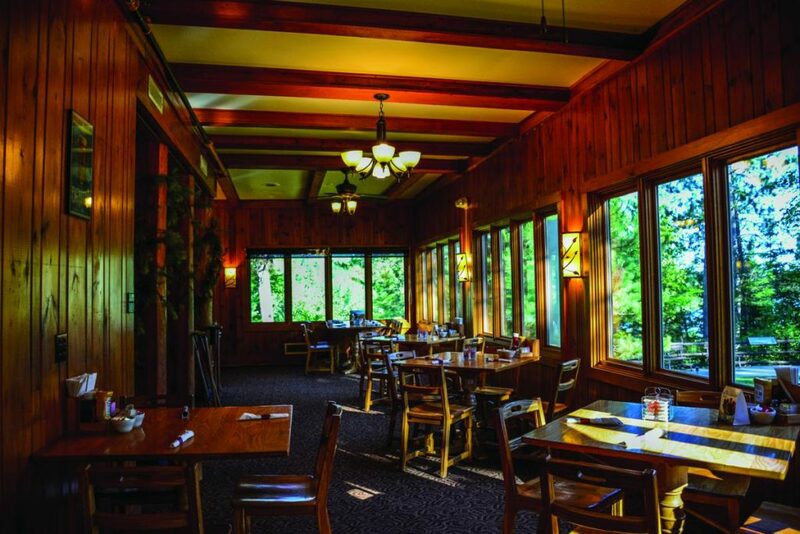 It offers seven lodge rooms, 16 cabins and a full-service restaurant that overlooks Lake Itasca. The menu includes local dishes like wild rice soup, wild rice salad and classic Wild Rice Hot Dish, a blend of rice, ground beef, water chestnuts, celery and mushrooms. Try the elk burger, walleye sandwich or walleye with apple-cranberry stuffing. One- to three-bedroom cabins at Douglas Lodge, each with private bath, can accommodate up to eight persons. The nearby Clubhouse, another two-story log building, is rented to groups as large as 21. It has 10 bedrooms, six washrooms, a common area with a fireplace and a screened-in porch overlooking Lake Itasca. Recreational amenities at the park range from hiking and biking trails to a sand beach for swimming and volleyball. One six-mile bike trail goes to the headwaters; bike, canoe and kayak rentals are available. Examples of naturalist-led programs, offered year-round, include a headwaters history walk, plant identification hike and campfire program on mammals of Itasca. Programs can be tailored to a group’s interest. Whether your group is looking for outdoor adventure in the northwoods or just wants to witness the source of the mighty Mississippi, Itasca State Park is the place for fun and discovery.